Top Kenyan female celebrities on Wednesday evening took to the ring for rounds of boxing bouts in solidarity with Kenya’s top boxer Conjestina Achieng whose deteriorating health and devastating living style recently hit the news headlines. The ‘Women for Conje’ bout was held at the Crescendo Bar & Grill in Karen and is one of ‘Pamoja na Conjestina’ initiatives organized by Suzanna Owiyo and ambassador Yvonne Khamati targeting to raise funds towards supporting Conjestina’s quick recovery, possible comeback and above all a descent lifestyle. Prime Minister’s wife Idda Odinga was the chief guest during the event that witnessed top female celebrities punch each other in the boxing ring. These included: Kiko “The Killer” Romeo vs. Sheila “Sister of death” Kwamboka, Pinky “The Panther” Ghelani vs. Lillian “The Fast and Furious” Muli, Laura “The Destroyer” Walubengo vs. Suzanna “the Slayer” Owiyo, and Iddi “The Africa ThunderBolt” Achieng vs. Kalekye “The Lady of Rage” Mumo. 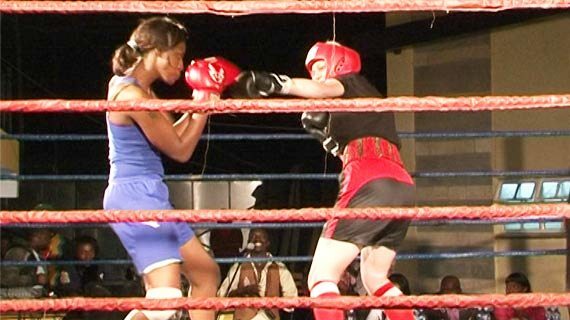 Sheila Kwamboka, Pinky Ghelani, Suzann Owiyo and Iddi Achieng won the first rounds by knocking their opponents out, then ‘Sister of Death’ Sheila Kwamboka knocked out Pinky The ‘Panther’ Ghelani in the semis while Iddi ‘Thunder bolted Owiyo in the second semi. “When they say boxing for sure it is not easy. I started it out and I thought it would be easy, but then she hit me hard and my jaw is hurting but it’s all for a good cause because the pain is worth it and I am glad to have taken part in this for the sake of one of our own.” Said Kalekye Mumo after being knocked out by Iddi Achieng. “I have never experienced what guys go through in the ring, I was very tired but the feeling was good. I just feel like I now need to do it more for my own exercise. The turnout was very good and I appreciate the support from everyone. Thanks a million for everyone who came here for Conje’s sake and the rest of the female boxers out there.” Said Suzzana Owiyo. Kiss TV reporter Michelle Katami who broke the story on KISS TV was also among the guests at the event. She said, “I was delighted seeing Kenyans united for the sake of our athlete. This was so touching and my greatest joy will be to see the turnaround of a celebrated top African boxer. But I believe Conjestina represents many other suffering boxers and sportsmen out there. We just need to find long lasting solutions that will support our athletes especially after their careers take a competitive nose dive.’ She says.